We shot this video driving through Seoul the other night. Saturday night was AMAZING out, perfect weather and a nice breeze. Seoul tower looked amazing and so did all the buildings, the temperature was perfect to have the windows down and enjoy the cityscape flying by as we drove. Even the rain could stop Sarah from taking some amazing video that I was able to edit together. We hope you enjoy it! Sushi, Sashimi, on Saturday -Oh My! Today we woke up to one of the most beautiful days since summer had begun in Korea. Nearly no humidity, sun not scorching, and NO RAIN. The statement of NO rain is pretty big in its self. We Bees had another hectic week. This time we both suffered an unfortunate visit with food poisoning. We will let the surprising culprit remain anonymous from our blog. Maybe eventually they will redeem themselves…in a year or so? We set out with the only intention of scoring some good grub. Along the way we took a bit of a detour to stop at Bukhansan National Park and visit Jinkwansa Temple and take in the sights and play with the camera. Jinkwansa Temple is well-known for temple stays. 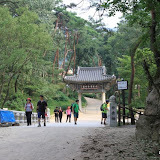 On a side note, we will be blogging about our temple stay experience in a few weeks at another well-known temple here in Korea. Now onto the good stuff, sushi! After a few days of eating plain white rice and plain jane toast for breakfast, lunch, and dinner, one finds themself wanting and craving something different and flavorful! Sushi! Recently we were let in on a little best kept secret that goes by the name of Fuji Restaurant. We were delighted to finally get to check this place out and like we said it could not have come at a better time. Fuji’s menu features an assortment of roll’s and sashimi. the rolls had names such as the Caterpillar, HOT Night, Crunch, Alps Mountain, and Las Vegas. There were plenty of others but we are not going to spend time typing them all out. Plus we don’t want to give too much away if you go and check out for yourselves. Sashimi menu options are tuna, white tuna, salmon, tempura, and udon. Sushi or sashimi more of your partners thing? No worries, Fuji’s menu also features dishes like Bibimbap, fish cutlet, rice, fried dumplings, salads, bulgogi, etc. We Bees shared a combo of eel, tuna, salmon, shrimp, the green dragon roll, crunch roll, and crazy roll. For dessert we each had mochi ice cream. Final verdict, we LOVED the food! The prices were much better than what we would have paid in the states. After dinner we messed around with the camera some more but of course all good things must come to an end…RAIN! Luckily it was just a passing shower and it went as fast as it came. Please feel free to view our pictures from our Saturday and let some comments. We hope you enjoy the rest of your week! After a pretty eventful and exhausting weekend of scuba diving lessons we find ourselves already well into Sunday evening. Really, where does the time go?? Do all of you feel that the weekends come and go in the blink of an eye? Hopefully you do get to take some time to yourself and think about all of the blessings that you have in your life. Today’s Mrs. B’s birthday! 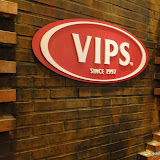 To celebrate we decided to try out a more “westernized” restaurant called VIPS. VIPS comes highly recommended from a close “foodie” friend so naturally we are eager to try it out and possibly score some comfort foods reminding us of home. The restaurant is located right on highway 3 in downtown Uijeongbu. VIPs is known for pretty tasty steaks and a HUGE delicious saladbar! After enjoying our dinner there we have to agree. If you can’t find something at this place to eat…I’m not sure you will find anything, anywhere, in South Korea. They offer just about everything on the saladbar! We are talking pizza, cook to ordered pasta, fruits, soups, various veggie dishes, various salads, make your own tacos, make your own bibimbap, frozen green tea and vanilla yogurt, an espresso bar, an assortment of seafood, and so much more! Right off the bat this place is a bit pricier, however you can opt to just get the salad bar buffet and truly you will leave just as fat and happy. The steak prices range depending on your preference and cut. The saladbar price might seem a bit steep but like we said, they offer just about everything on it! We really enjoyed the family atmosphere of the restaurant. There were so many families dinning together and it made us think of home and our families. We miss you guys and wish you could all be here to enjoy all of our special moments in South Korea. Part of the way through the meal a younger Korean family was sat next to us with the sweetest little girls that entertained us with their VIPS balloons. They also were incredibly generous and snapped a quick picture of our group for our blog. Here is to another great dinner down in the blog!